Winters in Wyoming can be harsh; snowfall is usually heavy during the coldest months and it can often be made worse by high winds and storms. At Cedar Mountain Tree & Lawn Care, we want to make sure your yard stays safe and healthy, and that by the time summer rolls around, you’ll still have a nice yard to look at and enjoy without the hassle of repairing trees with damage that could have been prevented. Although wind can be a problem at all times of the year for Wyoming homeowners, they can oftentimes be worse in the winter months. This causes stress to trees and shrubs, especially if there is snow or ice on them. If a tree or shrub has snow or ice on it and it sways from the wind, it will cause more damage than if there was nothing on them. 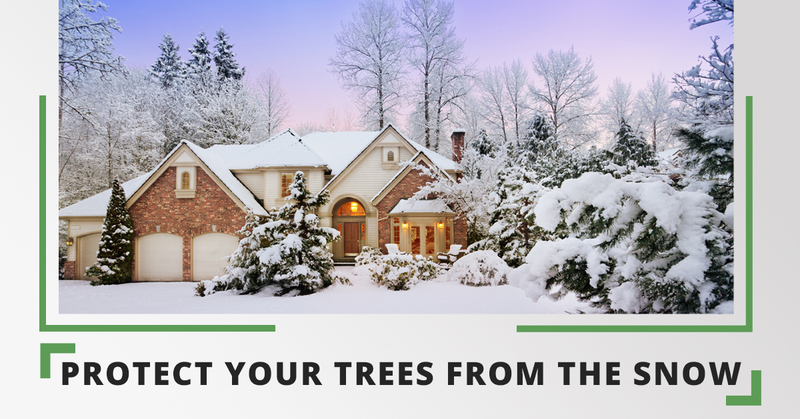 Additionally, snow and ice can cause your trees to dry out and become brittle, making them more likely to break and fall on your home or create a safety hazard in your yard. It may be a good idea to cover your trees or brush the snow off after a snowstorm. Aside from heavy winds, snow and ice can cause significant damage to your trees in the winter months. Light snow is common and shouldn’t cause too much damage to your trees, however, if the snow is wet and heavy, your trees may begin to collapse under the weight. Use a broom or shovel to gentle brush some of the snow out of your trees if they look they are being overburdened. You don’t need to spend all day brushing off snow, but it’s helpful to prevent long-term damage to your trees if you at least remove snow from the most weighed down areas, especially if it looks like it could be a hazard. If summer rolls around and your trees have sustained some damage, contact your local tree experts for a free consultation. Another issue caused by cold, snowy, icy, and windy winter months is dehydration. Dormant plants still need water and if they aren’t getting enough, they won’t remain healthy throughout the winter. It’s especially important to water shrubs and trees if the soil temperature is above 40 degrees Fahrenheit to avoid freezing. If your trees have sustained damage in the winter, you’ll want to call tree specialists who can fix your issue with as little hassle as possible and get your yard back to the healthy and safe state that it was in before the cold months hit. Cedar Mountain is your Top Rated Local® Tree and Lawn Care company in Wyoming. We service Riverton, Lander, Arapahoe, Green River, Thermopolis, Shoshoni, Rock Springs, and Fort Washakie, so don’t hesitate to contact us if you have any questions! To learn more about maintaining your trees and lawn all year long, stay tuned to our blog and visit our website for more information.